The common French sorrel on the left and the pretty, but tougher and slightly bitter red-veined sorrel, on the right. 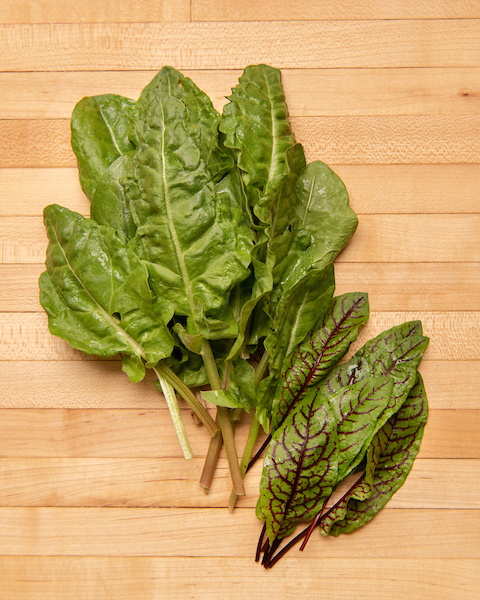 Sorrel is a tender, leafy perennial herb/green with a distinct tart and lemony flavor. It is one of the easiest things to grow. It multiplies rapidly and is very hardy. There is also a red veined variety that is beautiful, with slightly firmer leaves, that can be used interchangeably. It’s one of the first greens to pop up in late winter and is a welcome bright flavor that time of year. I grew up picking it in the wild in Germany so my mother could add it liberally to green salads. The French puree it into soups and cook it gently into a sauce. It loses its bright green color when cooked and mellows out a bit. I like adding it raw to an Italian Salsa Verde or adding it to salads or soups or sauces.